Vintage evening dresses don't come more characterful than this stunning 1970s disco dress! Just check out the killer combination of swishing silky shine, emblazoned shimmering collar and power dressing shoulder pads. This dress is not for the faint hearted but for those who are brave enough this vintage blue midi dress is guaranteed to knock 'em dead on the dance floor or at a summer festival. Go sleek and add a simple envelope to compliment this stand out look. This is a navy blue vintage 1970s dress featuring a flared and scalloped midi length skirt with mother of pearl patterned zigzag trim, drop waist, plunging v-neck line adorned with a shimmering mother of pearl inspired blue, purple and pink patterned trim. 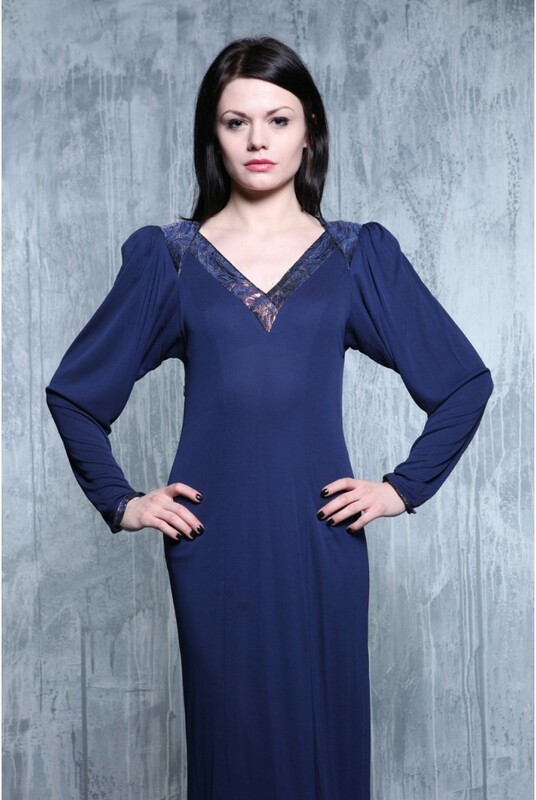 The dress boasts fantastic billowing long bat-wing sleeves with tapered cuffs and ruched shoulder detailing over large shoulder pads. The dress is a UK Size 10-12. Condition: Excellent save for 2 spots on the front as pictured.